Imagine a disaster scenario: burning lava, an earthquake or maybe just the fusebox has blown and you need a light – where’s your flashlight? Your pocketknife? Your energy pills? Why, of course, they’re in pockets on the cat’s emergency jacket. Yes your cat can have an emergency jacket. 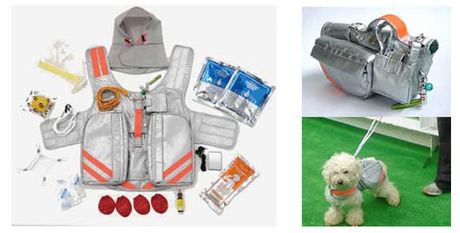 The pet emergency jacket is a real true product you can buy, from helpful website JapanTrends. The Pet Evacuation Jacket is good for you and good for the cat. Made of flame-retardant material it comes with a convenient carrying handle for picking up and transporting your skittish pet in times of crisis. = Win for cat. Packed into the sides of the jacket are pockets containing pet food, transportable pet bowls and your own emergency kit: flashlights, nutrition packs, a first aid kit and an emergency whistle. = Win for you. Above all, the pet evacuation jacket is another triumph for Japanese design. Just make sure that kitty wears its jacket at the right time, oh and it weighs 20lb so make sure you tone up its forelegs to cope with the weight.